Still, nearly two years into his term, de Blasio is dogged by a reputation for tardiness, as well as other negative elements of the first impression he gave many New Yorkers. The mayor is now in the midst of efforts to solve a public perception problem that siphoned some of his popularity and led de Blasio to adjust his approach on several fronts. 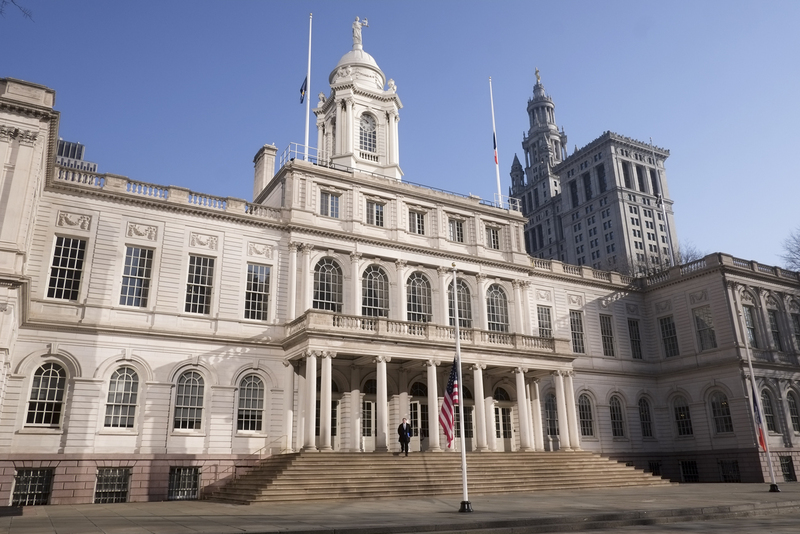 While you only get one chance to make a first impression, de Blasio and his team are at work to see how much they can do to change popular criticisms of him and the general sense, among some, that he has the city headed in the wrong direction. Along with chronically late, some have come to see de Blasio as dogmatic, narrow-minded, and insulated; Self-aggrandizing, with his head in the clouds - more concerned with national politics than New York potholes; Ineffective at mitigating problems like homelessness; Anti-business, anti-wealth, and, perhaps most damaging, anti-cop. Fair or not, these are the details of the de Blasio caricature. Most don't see de Blasio as all these things, but each appears a popular - or damaging - enough characterization that the mayor has sought to correct them all. Negative public perception of the mayor has been fueled by unnecessary errors, like showing up late or frequent trips out of town; by calculated decisions - insisting Albany approve a tax increase on the city's highest earners, for example; and by those who never liked de Blasio, disagree with his worldview, and want to see him defeated. The number of de Blasio critics has grown, media memes have taken hold. This summer, as cries about the mayor's focus and about a rise in street homelessness blared, de Blasio's poll numbers sunk. The mayor appears to have taken notice. 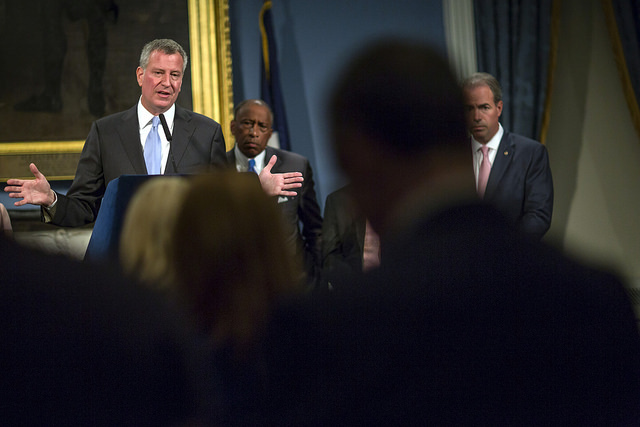 Consciously, assertively, de Blasio is working to change his first impression. The mayor talks about the NYPD in almost exclusively positive terms now; he has made more appearances on the radio and on Staten Island, partnered with real estate developers and other business leaders, and even begun treating his predecessor with more esteem. To some extent, he has already been successful. With wealthier New Yorkers and police unions, de Blasio appears to be digging himself out of holes he burrowed last year. But while de Blasio insiders feel they are on firmer footing, they await public opinion polls showing more widespread improvement. "The mayor has made a concerted effort in the last year to reach out to members of the business community," said Kathy Wylde, CEO of the Partnership for NYC, a leading business group, "to get to know them, to hold roundtables with various sectors - finance, media, tech - where he has listened to the issues that the key industries are facing. For those that have had the opportunity to sit down with him, to get to know him, they have felt very positive about his commitment to many priorities that the business community shares." On the day of this article's publication, de Blasio was set to "meet with CEOs from the TAMI – technology, advertising, media and information – sector" and then hold a press conference outside a home on Staten Island to make an announcement about Sandy recovery, according to his public schedule. "There's an appreciation that he's made a real effort to build relationships," Wylde said on Wednesday in a phone interview, "most recently including reaching out to Mayor Bloomberg." Wylde confirmed that de Blasio's changed tone toward Bloomberg and the fact that they had planned an event together had been received positively in the business community, which Bloomberg is of and adored by. The event, a tree-planting to celebrate completion of a Bloomberg initiative, was rescheduled due to the killing of police officer Randolph Holder. De Blasio's relationship with the police and strident NYPD supporters has been more tense than with any other group. Holder is the fourth police officer killed during de Blasio's mayoralty, a statistic not lost on his harshest critics, who despised the mayor's campaign - which focused on NYPD reform and criticized Bloomberg and Commissioner Ray Kelly - and predicted a return to 'the bad old days' with de Blasio in office. The city has not experienced such unraveling, but as de Blasio and NYPD Commissioner Bill Bratton reform policing, scrutiny of public safety is heightened. As is de Blasio's perceived level of support for the police. While Holder's death is certainly a setback, the mayor has made some headway since last winter, when two officers were murdered and others turned their backs on the mayor. Last December, before those officers were killed, de Blasio reacted to the grand jury decision not to indict police officer Daniel Pantaleo in the death of Eric Garner by explaining that he and his wife had to teach their son to take extra care when interacting with police. In 2015, his tone is different. De Blasio reacted to Holder's murder by stating that "We need to understand that the police are us." Officers did not turn their backs on the mayor at Holder's funeral, at which he made remarks. Since last December, de Blasio has become more protective of the police. He announced new bullet-resistant vests and technology for officers; and funded 1,297 new officers in his latest budget. He has heaped praise on the NYPD at numerous ceremonies and press conferences. Late last month, one of de Blasio's loudest critics, sergeants union president Ed Mullins, said that the mayor "takes a look a little differently at policing today than he did nine, ten, twelve months ago," according to the Daily News. Mullins, who is a registered Republican, also said that he continues to see a philosophical difference with de Blasio. That has been and will continue to be key for de Blasio: figuring out certain shifts in rhetoric and behavior that smooth important relationships with people who don't share his liberal bend, building broader support, and also remaining true to his progressive bona fides and base. Asked about the mayor's efforts to correct negative impressions and build better relationships, de Blasio spokesperson Karen Hinton said in a statement, "The Mayor is the same man today that New Yorkers voted for two years ago. That said, an effective leader always adjusts to changing circumstances involving city programs and services. Mayor de Blasio listens to the views of all New Yorkers and works to reflect their input in actions and policies that are appropriate and fair." Wylde, of Partnership for NYC, indicated that this is happening. She gave the mayor and his team credit for working with business leaders to alter some of the more "intrusive" City Council bills aimed at regulating industry and personnel decisions; and praised the mayor for his essential support of state-level changes to the corporate tax code. 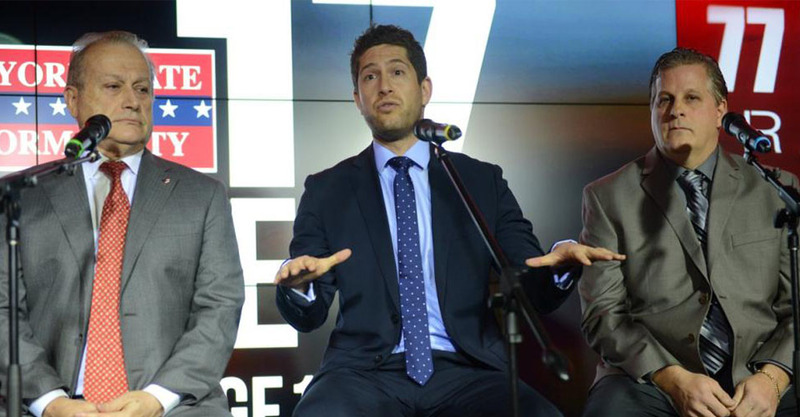 Of de Blasio and the city's business elite, Wylde said, "The political ideological alignment is never going to be there, but that doesn't stand in the way of the commitment that the business community feels to having a strong city and supporting the mayor's efforts to ensure that New York has a great education system and its economy continues to thrive." Asked if grumbling about the mayor had quieted in the business community, Wylde said, "New York City is a place where there's always grumbling, but people understand the city is doing well." And of de Blasio's 2014 pursuit of higher taxes on top earners and a different 2015 relationship with business, Wylde said, "He hasn't called for a tax increase since, and that's appreciated."